Please like our Facebook page for more information and updates. 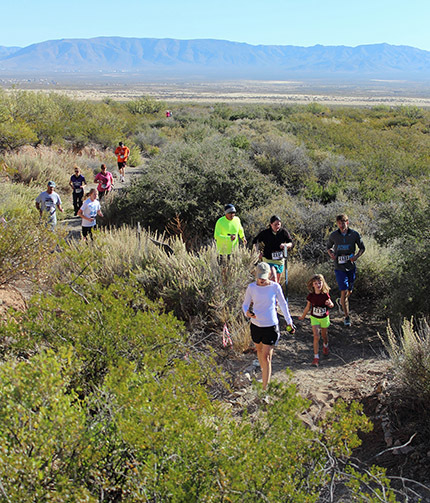 Enjoy expansive views of the desert, including three rugged mountain ranges, as you run or walk the beautiful 5K, 10K, or half marathon trail courses. 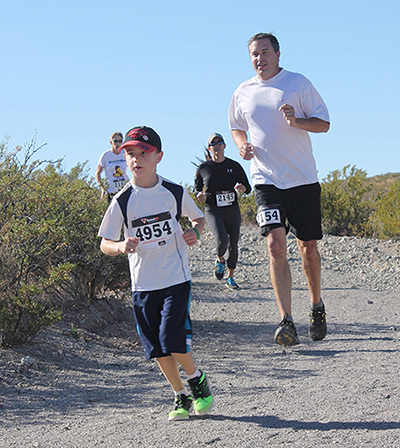 Bring your little ones to compete in the Children's 1-mile trail race (guardian should accompany child). All levels welcome. 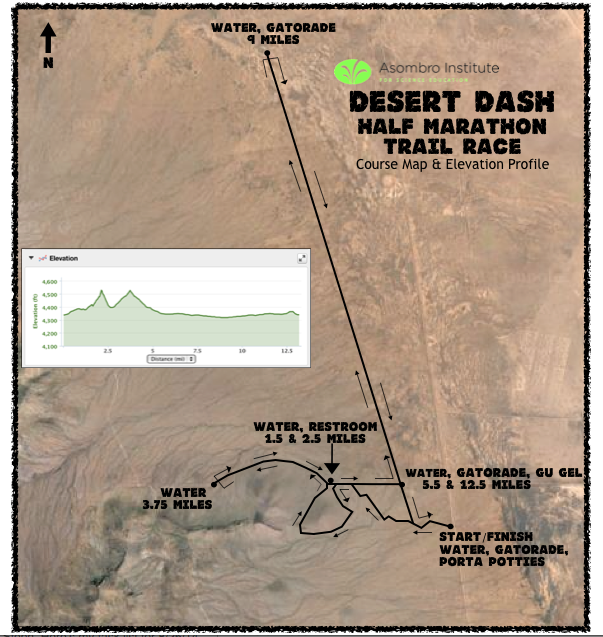 Desert Dash is a fundraiser for the non-profit Asombro Institute for Science Education. All proceeds will be used for our education programs. Our mission is to increase natural science literacy through engaging, place-based education. We reach more than 17,000 K-12 students every year through inquiry-based classroom programs and field trips. Half marathon, 10K, and 5K trails are not stroller accessible. Walkers encouraged on the 5K course. No pets please. *Guardian should accompany child during 1-mile Children’s race. Parking available adjacent to assembly area is limited; allow time to make your way to the starting line. 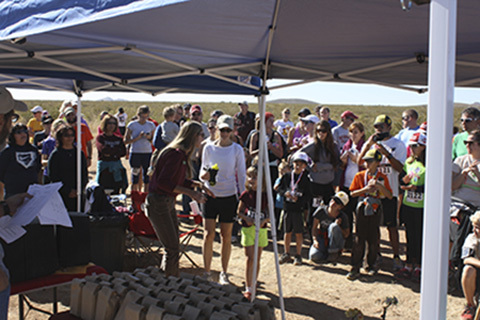 Pre-race packet pickup will be held at the Asombro Institute for Science Education office, located just southwest of the Las Cruces Convention Center. Directions from E. Union Ave: turn west on E. College; turn in to the first gravel parking lot on the north side of E. College; the Asombro office is in the yellow corrugated metal building on the northwest end of the parking lot. Race day registration and packet pickup will close 15 minutes prior to the starting time for each event. bronze sponsorship levels available. Sponsorship is tax deductible. Print and mail the sponsorship form today. Finisher medals given to all children in the 1-mile race. **Medals available for the first 125 finishers in the half marathon. Awards given to the overall male and female winners in the 5K, 10K, & half marathon events. Age group awards to the top 3 in the following male & female age categories in the 5K, 10K, & half marathon events: 19 & under, 20-29, 30-39, 40-49, 50-59, 60-69, 70 and over [Additional children’s groups for 5K only: 9 & under, 10-14, 15-19]. Age group awards in the top 3 in the following age categories in the Children’s 1-mi event: 3-4, 5-6, 7-8, 9-10, 11-12, 13-14. 1. Online: click here to register online through November 9, 2017. 2. By mail: print and mail in the registration form to register by mail through November 3, 2017. Mail-in registration postmarked no later than November 3, 2017. Online registration closes November 9, 2017 at 5:00 pm. Registration is available at packet pickup and on race day. ***Shirts guaranteed in the size requested to everyone registered by October 24, 2017. Half marathon, 10K, and 5K participants receive a short-sleeved, technical race shirt. Children’s 1-mile participants receive a cotton t-shirt. Technical shirts available in women’s and unisex sizes until the shirt deadline, and only unisex shirts will be available after the deadline. For participants registering after the shirt deadline, remaining shirts will be given on a first come, first served basis at packet pickup and race day registration. From I-25 in Las Cruces, New Mexico, head east on Highway 70. Make a U-turn under the highway to head west on the frontage road. Turn right (north) on Jornada Road. Proceed north on Jornada Road for approximately 6.5 miles. Turn left just before the Chihuahuan Desert Nature Park entrance sign. Follow the entrance road west to the Nature Park parking lot and trail head. 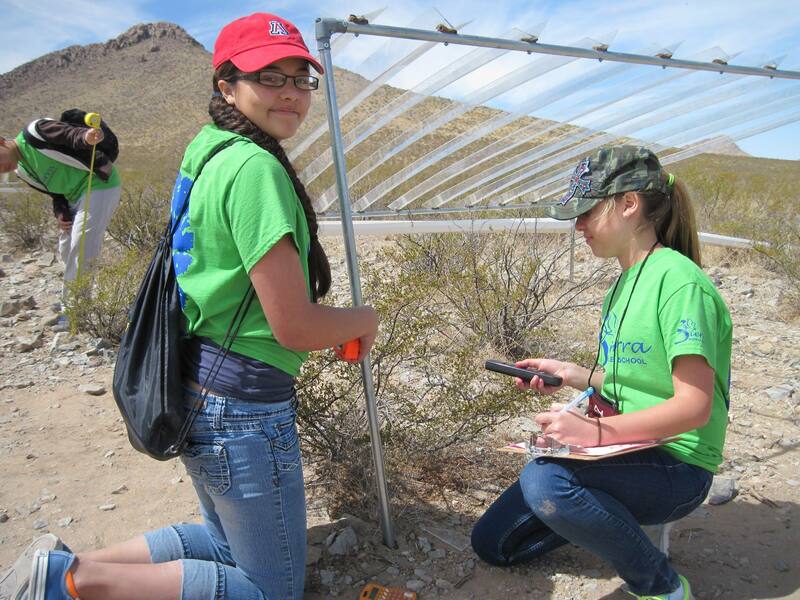 Through the Asombro Institute for Science Education, students conduct inquiry-based science activities at the Chihuhauan Desert Nature Park. Your sponsorship will make opportunities like this possible for local youth!